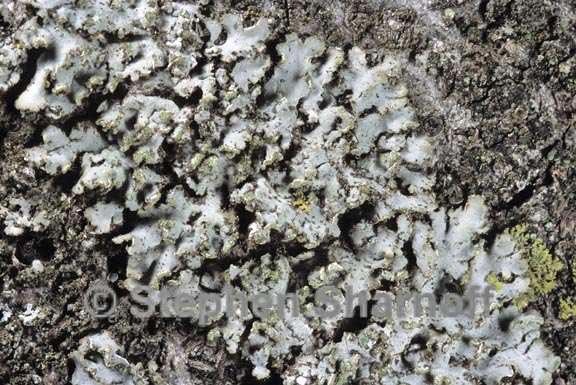 Thallus: foliose, up to 3(-4) cm in diam., irregular to more often orbicular lobes: linear and discrete to often irregularly rounded and partly imbricate, 0.5-1(-1.5) mm broad, usually +flat, prostrate upper surface: gray to gray-brown or brown, commonly but very inconsistently maculate, with sparse to numerous multicellular cortical hairs (15-20 µm wide at base and tapered to a point, 50150 µm long) near the lobe ends, epruinose and without distinctive epinecral layer, sorediate soredia: finely to somewhat coarsely granular, only rarely becoming pseudocorticate and isidioid, infrequently bearing multicellular hairs like those on the lobe ends (but smaller), in primarily marginal and terminal soralia that are short to elongate and linear, plane to +reflexed or even labriform to capitate upper cortex: paraplectenchymatous medulla: white lower cortex: paraplectenchymatous lower surface: black, sometimes paler at the lobe ends, dull; rhizines: simple, black Apothecia: infrequent but sometimes numerous, up to 2 mm in diam., sessile; margin: entire or occasionally lobulate, usually with cortical hairs like those on the lobe ends ascospores: ellipsoid, 18-25(-28) x 7-12(-14) µm, Physcia-type Spot tests: all negative in cortex and medulla Secondary metabolites: none detected. Substrate and ecology: most often on bark, but also commonly on rock World distribution: North America, Europe, and Africa Sonoran distribution: common throughout both Mexico and the U.S.A.. Notes: Phaeophyscia hirsuta is characterized by the presence of multicellular cortical hairs on the lobe ends and by the primarily marginal or terminal soralia. The form of the soralia, however, is exceedingly variable, from linear and marginal to more terminal and weakly to strongly reflexed and labriform. A variant seen only in occasional specimens from the Sonoran region has soralia strongly reflexed and becoming essentially capitate. The variability in form of the soralia in this species is reflected by the considerable modern synonymy. In my original treatment of North American taxa (Esslinger 1978), I distinguished P. hirsuta, with labriform soralia, and P. cernohorskyi, with elongate marginal soralia, a treatment also used by several other authors (e. g. Poelt and Buschardt 1973; Nowak 1993). However, study of a large amount of material during the course of this study has convinced me, that there are too many intermediates to justify recognition of these taxa at the species level.